. . . and babies make four. : On the fourteenth day of Christmas . 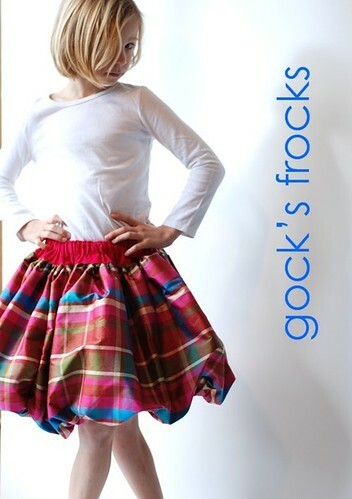 . .
Gocks Frocks was the very first etsy shop I ever purchased something from for the girls. 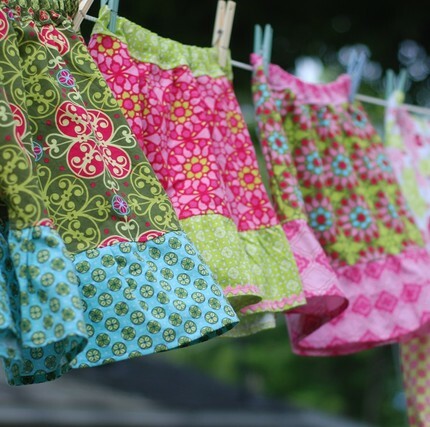 I was brand new to etsy and was just jumping around from store to store when I came upon the cutest little skirts I'd ever seen. Gocks Frocks is owned by Kristen, who is a SAHM to three spirited little boys she fondly calls thunder, lightning and rain! She also is a wildly talented seamstress who makes really beautiful things. Since that first purchase, Kristen has made my girls the cutest Easter skirts they've ever had, the skirts and tees they wore for their fourth birthday and numerous other things. Plus, anyone who places an order during the month of December will receive FREE SHIPPING. Just mention andbabiesmakes4 when you checkout. 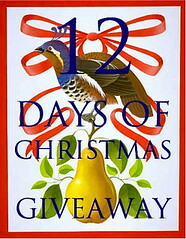 You may enter this giveaway until December 20 at 12:00 midnight. The Sis Boom Vintage is the cutest ever!!! http://www.annikagrace.blogspot.com/ Thank you so much Kristi...this is soooooo much fun!!! Cute clothes! My favorite is the Sasha Yoga collection women's skirt. It looks so comfortable and is very versatile. My favorite is the floral loop girls dress. The entire collection is very nice. Thanks for sharing. I LOVED the polka dot garden skirt, it's just TOO CUTE!! I love the Bubbles...tiny silk bubbles and the Sasha from the yoga collection!! Oh, I want them all! I would love the secret garden in pink for my sweetie pie! I love fabrics, and this designer coordinates them together beautifully! I think my favorite is Tiny Stripes from the Andalucia Collection. I would have a difficult time choosing on this one! I love little matryoshka! I like the bold colors. I love the apple salsa skirt! I have ordered some of these skirts in the past and they are very well made and are adorable! 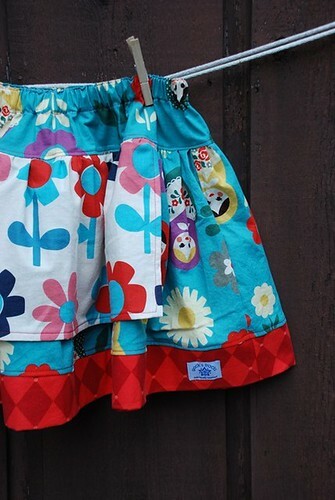 I love the sis bloom vintage floral dresses and the little matryoshka skirt! So cute! I love the little matryoshka.. I love them all but that one kind of stuck out to me. I like the colors and the pattern is sweet! These are fantastic - so bright and fun! I showed my daughter the pictures on the website, and while she loved "them all! ", she picked out Mod Blooms Petal. LOVE the mermaid overalls and the patchwork skirt. I have admired her work before on Etsy-so cute! Wow -- so many cute things! I love the Emily handmade skirt! Makes me long for springtime! Mod Blooms Petal skirt is perfect! It is pink and Mia loves her pink! I love the emily skirt. Great stuff! Oh, I've been drooling over Gock's Frocks for a long time, but wasn't brave enough to take the plunge yet. I can't decide what I like best, lol. I really adore the grape pie skirt... or the secret garden lime! I have 1 boy and 3 girls and it's sooooooo hard to find cute, cool boy stuff. I love the boy Tie Tshirt. That's awesome!! Absolutely love the Tiny Stripes from the Andalucia Collection. I love the Lily dress from the Vintage Garden collection. So pretty! Its a toss up between the emily and neptune! All so beautiful!! I love the Charming Collection II girl's skirt. I love the Matryoshka skirt, a must. I love the bubble skirts! I adore the Virginia skirt with the zebra stripes at the bottom. Something else I like about this shop is that I could get the same skirt made for both my girls (ages 11 and 4) They love to wear matching clothes but rarely get the chance. I am having so much fun with this. Even though I haven't and probably won't win anything I am enjoying all the looking around and shopping I am doing. I love them all, but really love the Ginger Tile, and the Aunt Grace. My favorite is the Oh cherry oh skirt. So cute and summery. My Mother's Garden dress. Really, all of the items are just adorable. Oh the Mod Blooms Petal skirt was precious! Thanks for sharing this site, the items are beautiful and look very well made. I love the Marianne skirt. Such a talented lady! My favorite is the floral loop girls dress. Too cute! I love the apron skirts! So cute and such great fabrics. Hi... I love the vintage floral loop girls sleeveless dress! I love everything that she has but I totally love apple salsa. I may just have to order one of her designs even if I don't win. Thanks for all the giveaways! Ah, loved the Mod Bloom Petals. And how convenient- it's ready to ship in a size 4- just the size I'd need. :) Yet another shop to bookmark- LOVE it!! I really can't decide! But the little matryoshka is awfully cute. Ooooh, actually, I like the Apple Salsa the best! OOOOO the yummy cherry skirt. There are so many darling things to choose from, but my favorite is the Water Lily skirt. It’s adorable and sweet. Thanks for sharing the fun with all of us! little matryoshka is my favorite! Everything is so beautiful! I love the floral loop girls dress. The "Let's Play" pinafore set is adorable! Actually, all of her creations are adorable! I love her fabric choices! How can you pick just one? I love them all! But anything from the yoga collection would be cute, especially since Kerri has that tiny little waist. Oh how I love Cherry Twirl. Oh man I love these skirts! Tempted to order a Pink Stained Glass skirt for me! Love it! Another favorites added to my ever growing Etsy list. Seriously...I can't pick just one! Frances magenta floral bubble skirt and Apple Salsa are two of my favs! The Water Lily print skirt is just precious! Oh my gosh - these might be my favorite yet!!! I absolutely love the Apple Salsa, but come one - they are all too good to be true. I love these skirts! I like the secret garden and stained glass ones most of all, I think. I am in LOVE with Mod Blooms Petal!!!! Vintage Collection - Frida dress is my fave. Mod Blooms Petal skirt is my favorite! Wow, I adore those bubble skirts, the Frances in particular. I love the secret garden lime skirt for MacLean. It is such a cute site. I have bookmarked it. Thanks again, it is so much fun . I like the Apple Salsa skirt. It's so hard to narrow it down but I like the Julia. Thanks! The silk bubble skirt is too cute! I LOVE the Queen of the Dance pink tutu! My little dancer, Marissa thinks this is so cute! We also like the Frances - magenta floral bubble gum skirt. I didn't know Gock's Frocks had so many choices. I am pleasantly surprised. I like the "modern patchwork" woman's skirt from the Yoga collection. Thanks! I LOVE LOVE LOVE LOVE the sis boom dresses. I wish they came in a bigger size. I am going to see if y=she can do one for me. Sultry for sure. These are wondeful! What a fabulous Etsy store! I love the Spring Showers skirts. Thanks for the fun giveaway! So cute! I love the Ginger Tile. I love the patch work skirts for little girls, all of them!!!!! The Emily pears print is cute cute cute. My picks are the Tiny Stripes, Neptune and the Lily frock. Of course, if I won, I'd have to buy an appliqued tee to go with it! Those are darling, too! I love the Mod Blooms Petal skirt. Thank you so much! Sis Boom Sassy is way too cute! Love the Mod Blooms Petal Skirt! Love the little girls skirts! My favorite is the Olive Rose pattern. Hope I win!!!! I have never seen the bubble skirt. I really love that. That would be my choice. Wow! Your ideas are fabulous! My fave is CALL ME CRAZY Quartet, so beautiful! Gocks Frocks was my first Etsy purchase too and now I am addicted! Love the skirts so much. The obsession in our home is with pink but I love vibrant pink so the mod blooms petal skirt is my fav. How does one pick. I love the patchwork collection skirts - so I guess one of those. The one with browns and pinks. I like the cherry skirt. How can one choose...they are all so darling. Even though our little China doll grand-daughter isn't big on skirts (she loves just leggings and shirts)I think she would love the dot garden skirt. This is fun...please pick me! I really like the Gothic Arch handmade girls skirt from the Mezzanine Collection. They're all so cute but I think my daughter would look especially adorable in this! What cute clothing!! That matrioshka skirt would be perfect for my Russian-born daughter! I love, love the Cherry Lei skirts! But honestly, everything is darling! Love it all. I love them all, but secret garden pink caught my eye. Love the Steffi! I found Gocks Frocks a long time ago and I love all her designs!! Have you seen Pretty Me - also on Etsy? OH! The little matryoshka is darling!!! I'd so get that one! LOVE the sis boom dress!!! 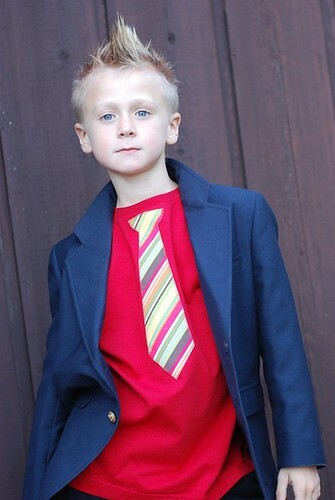 No wonder your kids always look amazing, look at these great clothes! Love it! The Emily with pears and brown zebra print is so cute. Really cute, I love the Mod Petal Bloom. I love the pink, orange, and red combo. Very cute. I especially love the bubblegum pink girls bubble skirt. I have found her! She does do beautiful work. Right now I am eyeing the matryoshka skirt. It is so difficult to decide! Cute! My shopping list is getting longer. Oh, this one is such a hard decision!! I love the sis boom vintage floral loop girls dress and the fairies in the forest dress and all those cute skirts!! The simplicity skirt from the charming collection. She has such great things!! Thanks so much for the chance at some of them!! The polka dot garden skirt is just adorable. I love the Annika aline jumper with the horses on it, but they are all cute.